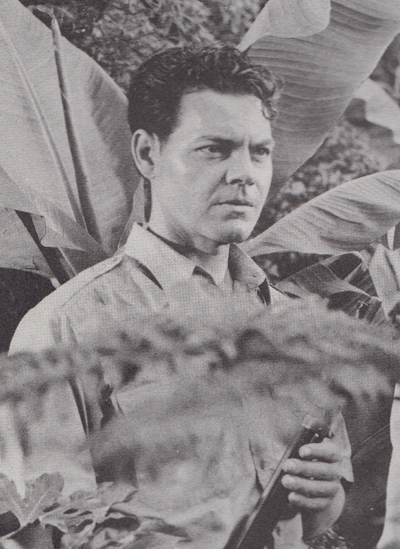 Above: Eddie Quillan in a still from the serial Jungle Queen (Universal, 1945). The diminutive, brashly self-confident, and infectiously cheerful Eddie Quillan belongs to the select group of serial sidekicks who could be quite funny without sacrificing their credibility as a serious assistant to the hero; at once a seasoned comedian and a good dramatic actor, he was able to switch from breezy flippancy to gravity whenever a situation required it, and could even convey a quiet but convincing toughness on occasion. Unfortunately, Quillan–unlike some of the other great serio-comic serial sidekicks–was never given a really first-rate cliffhanger vehicle for his talents, even though he played noticeable parts in no fewer than three 1940s chapterplays. Edward Quillan was born in Pittsburgh, one of the seven children of Joseph and Sarah Quillan–veteran actors who had spent years on the stages of their native Scotland, before emigrating to the United States and continuing their careers there. Eddie began his own thespian career at the age of seven, and spent most of his childhood touring the country with his parents and his numerous siblings, performing comic and musical sketches on the vaudeville stages of the upscale Orpheum theatrical circuit. While the Quillans were touring the West Coast in the mid-1920s, Joseph Quillan secured his children a collective screen test with Hollywood producer Mack Sennett; Sennett singled the teenaged Eddie out as a promising movie actor, and cast him in over two dozen comedy shorts (typically teaming him with bathing beauty Alice Day or Australian comedian Billy Bevan) from 1926 to 1928. In the latter year, young Quillan won a prominent supporting role in the Cecil B. DeMille drama The Godless Girl; this association with the famed director prompted Pathé, Sennett’s parent outfit, to start starring Quillan in feature films. Quillan preserved his star status for the next six years, playing leading roles in many comedies and dramas for Pathé and then for RKO Pictures, which absorbed Pathé in 1931; neither this absorption nor the transition from talkies to silent altered the course of his screen career–but the passage of years did. Quillan specialized in playing inexperienced, eager, and spunky young heroes in his Pathé and RKO features–but his small size, which was suited to such youthful parts, prevented him from transitioning into a standard leading man after he started aging out of youngster roles; by the mid-1930s, he had begun playing character parts. 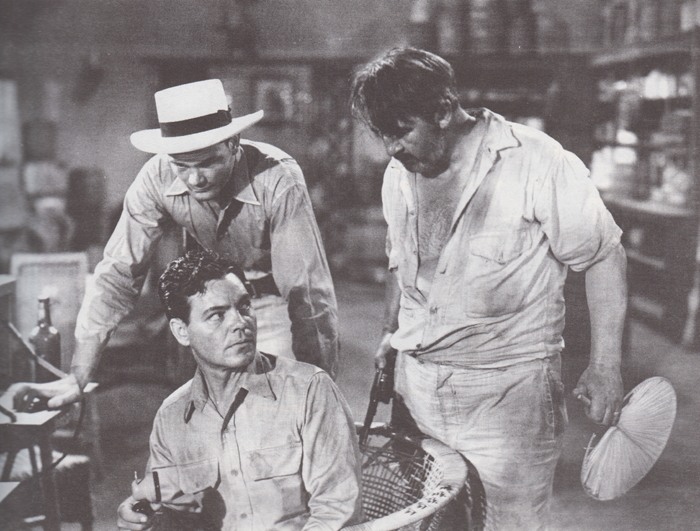 One of Quillan’s first efforts in the character-acting line–and easily the most memorable–was his performance as a likable but tragically luckless sailor in MGM’s famous 1935 film Mutiny on the Bounty; he played several other notable supporting parts in A and B features for MGM, Fox, RKO, and Universal during the second half of the 1930s, along with a couple of starring roles at Republic Pictures. Quillan played his last really prominent A-film role at Fox in 1940, in John Ford’s The Grapes of Wrath; the earlier years of the 1940s found him working almost exclusively in B-movies–mostly at Universal and Pine-Thomas. It was Universal that cast him in his first serial, Mystery of the Riverboat, in 1944; this interesting and slightly offbeat outing was the best of Quillan’s three serials, but also gave him the least screen time (even though he received second billing). 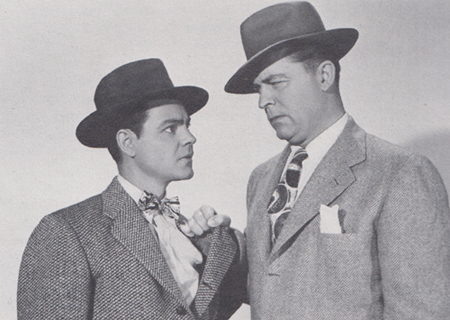 His character, a riverboat entertainer named “Jug” Jenks, was present from the start of the serial, but didn’t become directly involved in the plot until Chapter Four, when he accidentally discovered that the villainous Rudolph Toller (Lyle Talbot) was planning to rob hero Steve Langtry (Robert Lowery) of some supposedly worthless but actually valuable swampland property; Jenks was shot by Toller while trying to warn Langtry, and spent most of the ensuing episodes convalescing off-camera. He finally re-entered the serial in Chapter Eleven, and belatedly assumed sidekick duties during Riverboat’s last three episodes–assisting Langtry during a dangerous bus run and in oil-field battles with Toller’s gang. Limited though Quillan’s part in Riverboat was, it did give him a few good moments; his character’s bashful and awkward attempts to win the favor of glamorous but villainous riverboat singer Celeste Eltree (Marion Martin) and his later confrontation with her (after learning of her connection to the heavies) allowed him to be both comic and dramatic, as did the aforementioned bus sequence (during which he first made humorously exasperated comments on the procrastinations of a crooked bus driver, then became grimly serious after learning that the driver had sabotaged the vehicle’s brakes). Quillan’s role also gave him a couple of chances to return to his vaudeville roots: he performed a short comic knife-throwing act and a longer comic dance routine in Riverboat’s second chapter, to entertaining effect. 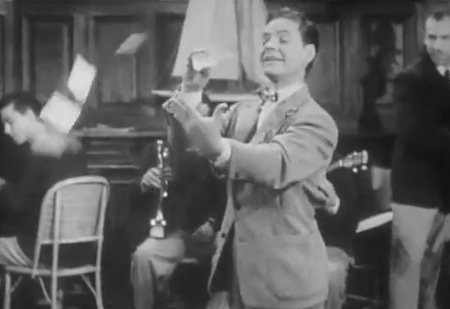 Above: Eddie Quillan interpolates an (unsuccessful) card trick into his dance routine in Mystery of the Riverboat (Universal, 1944). Above: Eddie Quillan seems unintimidated by Lyle Talbot in a publicity still for Mystery of the Riverboat. Above: Eddie Quillan rolls his eyes as heroine Lois Collier tries to explain the plot convolutions of Jungle Queen (Universal, 1945). Edward Norris is between Quillan and Collier. Above: Eddie Quillan threatens to plug shady barkeeper Cy Kendall (back to camera) unless the latter reveals where Edward Norris and Lois Collier are being held prisoner in Jungle Queen. 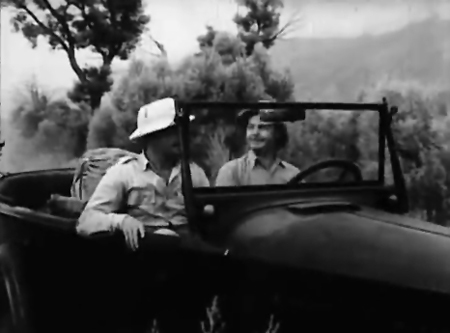 Quillan’s final serial was Jungle Raiders (Columbia, 1945), a pedestrian but generally enjoyable chapterplay set in an unspecified African mountain range and filmed in Lone Pine, California (where Quillan contracted a bad case of sunburn poisoning, which he had to work through). Kane Richmond starred in Raiders as Bob Moore, a World War 2 veteran trying to help his physician father (John Elliott) find a miraculous healing fungus possessed by the lost Arzec tribe; Quillan was cast as Moore’s war buddy Joe Riley, who assisted his friend in the search for the fungus–and also stood by him in multiple battles with an assortment of shady characters bent on stealing the Arzecs’ treasure of jewels. The cocky, frequently startled, occasionally clumsy, and incessantly joking Riley was somewhat more broadly comic than Quillan’s two previous serial characters, but Eddie still managed to make him seem humanly capable and intelligent–while simultaneously handling his clowning with vigor; he wasn’t able to make all of Riley’s non-stop wisecracks funny, but he did put many of them across in assured and amusing fashion. His sarcastic reaction to villain Charles King’s hypocritical protestations of repentance (“he’s breakin’ my heart”), and his wryly irritated efforts to get hero Kane Richmond to stop paying attention to heroine Janet Shaw and help him fix a jeep were particularly funny. 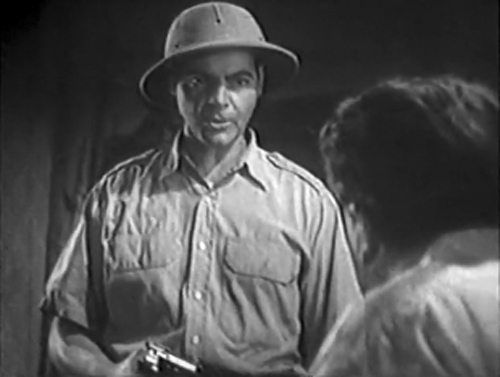 Above: Eddie Quillan reacts with humorous frustration, as he and Kane Richmond experience a jeep breakdown in the middle of nowhere in Jungle Raiders (Columbia, 1945). 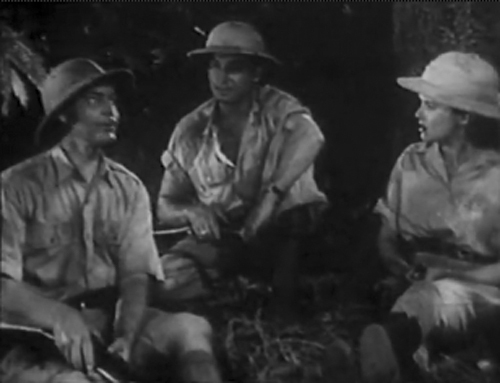 Above: Charles King (right) and George Turner try to force Eddie Quillan to make a radio call in Jungle Raiders. Shortly after Jungle Raiders’ release, Quillan temporarily abandoned acting to go into business as a bowling-alley owner; from 1946 to 1950 he devoted most of his time to this new enterprise, only making a handful of screen appearances in a sporadic series of comedy shorts for Columbia (in which he was teamed with another ex-vaudevillian, Wally Vernon). 1950 saw the release of Quillan’s first feature-film in four years, a B-crime picture called Sideshow; thereafter, he stepped up his screen appearances again, co-starring in several more batches of comedy shorts for Columbia during the early and middle years of the 1950s, and playing a small character role in the 1954 MGM musical Brigadoon. From 1958 onwards, he worked principally in television, but took occasional big-screen character bits as well; he appeared regularly on innumerable TV series (both as guests and recurring characters) throughout the 1960s, 1970s, and most of the 1980s. In 1987, the indefatigable trouper finally retired to Burbank, California, where he passed away three years later. Eddie Quillan tends to be better-remembered by mainstream movie buffs than by serial aficionados–unsurprisingly, considering that some of his feature films were outstanding representatives of their genre, while none of his chapterplays proved to be particularly memorable examples of their genre. Still, his vivid and amusing screen personality places him on a level with other great cliffhanging sidekicks like Billy Benedict, Eddie Acuff, or Noah Beery Jr., even though his serial filmography was not in the same league as theirs. 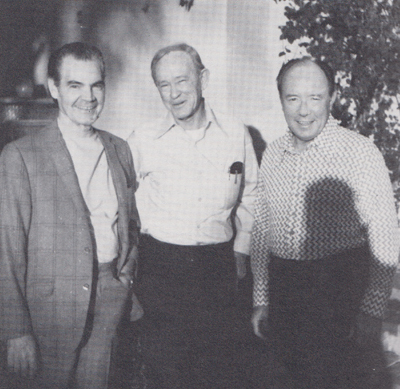 Above: Eddie Quillan poses with two other serial players, his fellow-sidekick and personal friend Billy Benedict (center) and Frank Coghlan Jr., in a picture taken by Jim Shoenberger and published in “Chapter” 21 (February-March 1973) of Those Enduring Matinee Idols. Acknowledgements: Most of the above information comes from a 1990 interview with Eddie Quillan, conducted by Joe Collura and published as “Eddie Quillan: Mr. Versatility” in Cliffhanger magazine #15 (WOY Publications, 1991). I also made use of the above-mentioned TEMI issue, several federal censuses, and of a 1950 Hollywood AP blurb (culled from the April 9th issue of Florida’s St. Petersburg Times).